Master Sweeping and Maintenance is in Georgia and does construction sweeping, parking area sweeping, power washing, pavement striping, and other pavement maintenance. We know how important it is to make a great first impression. When you switch to Master Sweeping and Maintenance, your tenants and customers will see the difference! A clean exterior is of paramount importance in creating a positive first impression about your business property. The fact is, cleanliness ranks as a top factor with where people choose to shop. 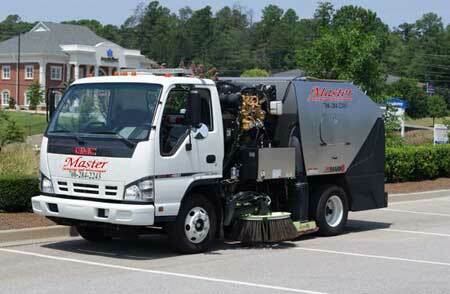 Master Sweeping and Maintenance is a full-service exterior maintenance company. In addition to power sweeping, we provide a complete slate of services designed to keep your property's exterior in top condition. Master Sweeping and Maintenance, Inc. is honored to have been chosen as WorldSweeper.com's Contractor of the Month for September 2009. With over 5,000 power sweeping contractors in the U.S., this designation is provided to only 12 per year. To see the article, which includes an 18-minute audio interview with one of our founders, Rick McCann, click here. Plus, when you are a Master Sweeping and Maintenance sweeping customer, you can count on our management team to keep you apprised of upcoming needs in order to help you plan for preventive maintenance expenditures. For example, we conduct a weekly free 'lights-out survey' for all our scheduled sweeping customers. We also take digital photos of any other problem areas we spot, from emerging potholes to abandoned cars and large items. These are sent to customers via email. We know that this is the best way to minimize your overall expenses and, at the same time, keep your property maintained in top condition. We invite you to look around our website to see more about our company and the quality services we offer. Then, please let us know how we might assist you with completing your sweeping or other outside maintenance projects, on time and within the agreed-upon budget. copyright © 2009 – 2019 Master Sweeping and Maintenance, all rights reserved.